Perhaps no other image is so firmly associated with rural America than the iconic red barn. Once common features of the rural landscape, many of these pieces of history are gone now - derelict, obsolete or more valuable torn down to be resold as barnwood lumber. Here at Double F Ranch, The Barn is our oldest free-standing structure and has served as the backdrop for the daily lives of the five generations of the Forman Family that have called the ranch home since homesteaded in 1902. Our homesteading forefather, Frank Forman (1882-1961) finished The Barn in 1910 and it is the oldest, fully-intact structure on the ranch. 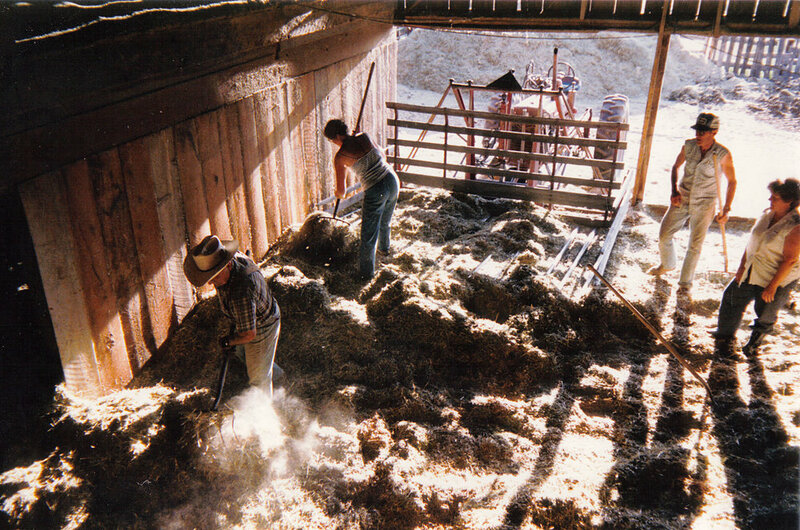 Frank built the barn to store hay and house his 20+ horse team used to farm wheat on his homestead claim. Constructed with only the tools of the day, including those same horses and mules, The Barn was the single most technical and expensive addition to the ranch. A marvelous example of craftsmanship; the strength, solidity and permanence of The Barn has withstood many tests of time over a storied 107 year history. With the introduction of the internal combustion engine, the horses were traded out for tractors but The Barn has been continually adapted over the generations to meet the changing needs of farming and ranching. Today, The Barn stores winter hay and also includes cattle sorting corrals and handling facilities, storage cribs for grain, a woodworker's shop and storage space. One of the greatest threats to homesteads in our high and dry desert climate is the threat of fire (the original house on property burned down in the 1930s). The Barn however, has withstood the challenge of fire. In August 1996, the Ashwood/Donnybrook wildfire torched 118,000 acres including our ranch. Roaring up Barn canyon, the 20-foot wall of fire encountered the corrals and barn first, but the fire trails held and the flames parted. When the family returned from the safety of the lush fields on the flat and looked over the canyon edge - there it was, a beacon of red amidst the charred earth. The diligent, hard-work of friends, family and neighbors had spared the family homestead as the flames completely skirted The Barn, the homes and outbuildings. This iconic structure is so much more than merely a building to store hay out of the weather. The barn is a symbol of the roots our family put down in this place more than 115 years ago. A symbol of our familial dedication and commitment to being stewards of this land for generations to come. To honor and celebrate our beloved Barn and homestead, in 2018 we will apply to join the ranks of the nearly 1,200 Oregon farms and ranches participating in the Oregon Century Farm program which celebrates families that have worked the same piece of land for over 100 years. Due to the quality materials and excellent craftsmanship utilized in construction, The Barn has withstood the test of time admirably. However at 107 years of age, some repairs are in order. Your donation will help us give The Barn a fresh coat of paint to protect the weather-checked wood from the harsh desert climate for decades to come. Help us preserve a piece of history. Restoring The Barn honors the contributions of generations past while preserving opportunities for the future.